Editor’s note: This article is reprinted from the October 2017 issue of The Thin Blue Line. Detective McBride is a director at the Los Angeles Police Protective League. This year marks the 70th anniversary of the Department’s reserve program, when the Police Reserve Corps was established by the Los Angeles City Council. Prior to that, during World War II, the concept was developed when the police officer candidate pool was depleted due to the war effort. At that time, the Department asked citizens to serve as auxiliary police and air raid wardens to offset the personnel shortages. However, it wasn’t formalized by City Council ordinance until 1947. Since then, many reserve officers have seen the value of becoming a League member, and pay yearly dues. The Los Angeles Police Reserve Corps is made up of community members who volunteer their time to fulfill many of the roles handled by full-time sworn police officers. Today’s reserve police officers receive the exact same training as their full-time partners, and are POST-certified. They volunteer their time for a modest stipend, which doesn’t begin to cover the expenses they incur for being a reserve. Many of today’s officers began their career as a reserve, and several of our reserves are former full-time officers who have retired but still feel the call to serve. During my career, the reserve officer program has become much more robust, with 438 current officers assigned. This equates to approximately 100 full-time officers serving throughout the Department, with assignments that include Patrol, Detectives (including specialized divisions), Vice, Air Support, Motors and Mounted units. The various levels allow those of all capabilities to serve. Level I and II reserve officers perform the same functions as regular, full-time police officers. They are armed, uniformed peace officers who work in police vehicles along with full-time officers. Level III reserve officers are uniformed police officers who are qualified to carry a firearm at 21 years of age. Level III reserves perform various administrative functions within the Police Department. Level III reserve officers are assigned duties at the front desk, with area detectives and in community relations. Level I and II reserve officers receive additional training to that provided to their Level III counterparts. To be a Level III officer, one must complete 144 hours of professional classroom instruction. Level II reserve officers receive approximately 189 hours of instruction, and Level I reserve officers receive approximately 394 hours. This instruction is in addition to self-defense training, and is completed on evenings and weekends. In a previous article, I wrote about the commanding officer of the Office of Constitutional Policing and Policy, Police Administrator Arif Alikhan. As a former federal prosecutor and deputy mayor, he has committed himself to becoming a Department reserve officer. One would think that in his position he would be able to slide by on his required reserve hours. To his credit, you can find him teaching in the Academy on subjects in which he is an expert. I may not agree with him on issues from time to time, but I applaud him on his dedication to our profession. We also have current and former City councilmembers in our ranks. Former City Councilmember Greig Smith serves in the Robbery-Homicide Division/Cold Case Homicide Unit, having completed detective school in addition to his mandated training. Former Councilmember Dennis Zine is a member of our Reserve Corps, in addition to current Councilmembers Joe Buscaino (a former full-time officer) and Mitch Englander. Anyone who has worked with or around our reserves knows the value they bring to our Department. Their motto is “To Be a Reserve Is to Be Twice a Citizen.” We have professionals, technicians and community members with a host of skills and experience that benefit us as individuals and as a Department. Every division that I’ve worked has had those reserve officers whom you could call at a moment’s notice, or who became a preferred partner after working a couple of shifts together. And these shifts are worked during their own time, in addition to their full-time careers or schooling. These officers are true unsung heroes of this city, and we all owe them a debt of gratitude for the service they provide. Being a member of the Reserve Corps serves many purposes, of benefit to the Department and to the City. Since police bashing has become so fashionable, together with the inflammatory media coverage, it helps to have community members as advocates who understand the challenges we face. When premature or blatantly false stories are spread, they can serve as the voice of reason in areas not readily accessible to us. We all agree that community support and cooperation is vital to our success, and this is one very effective tool to garner that support. 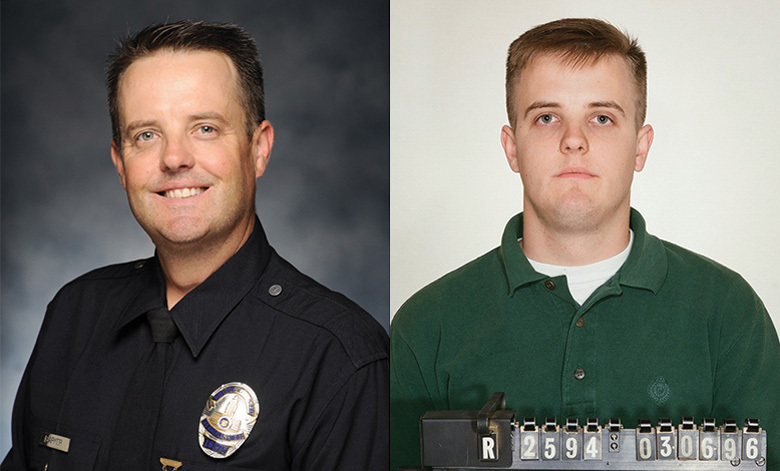 I would like to thank my friend Reserve Officer Matt Barker for volunteering his time protecting the citizens of Los Angeles for nearly 22 years (September 18, 1995, to July 31, 2017). I first met Matt at Newton and later worked around him at two other divisions. Matt worked so many hours, I thought he was a full-time officer! Congratulations, Matt, and thanks again for your service.